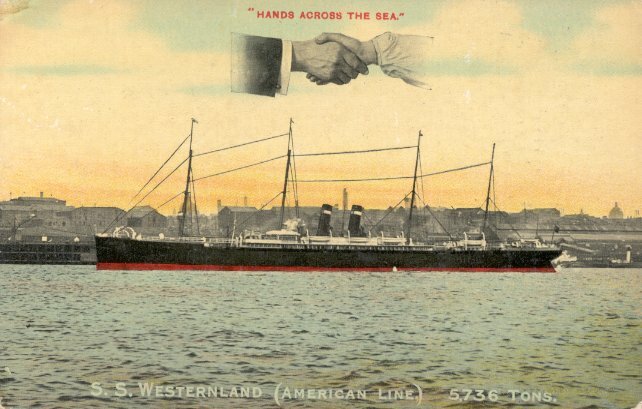 Westernland was built for the Red Star Line by Laird Bros., of Birkenhead. She was Red Star's first steel-hulled ship, the line's first ship with two funnels and the first Red Star steamer with three classes of passenger accommodations. She was built in drydock due to a shortage of building berths at Laird's, and was "launched" by being floated out of the drydock in August 1883. She made her maiden voyage on 3 November of the same year, from Antwerp to Philadelphia. She remained on that route through March 1901, when she was placed on the American Line's Liverpool-Philadelphia service. (International Navigation Co. owned both the American and Red Star Lines, and ships of one line were often used on the other's routes.) She returned to Red Star's Antwerp-New York service from March 1906 through January 1907, and made her last Liverpool-Philadelphia trip for American in September 1908. Westernland was broken up in 1912. Sources: Flayhart's The American Line; Bonsor's North Atlantic Seaway.